Any cinephile has plenty of cool movie memorabilia lying around their residence, but some choose to remember their love of film by collecting the ticket stubs of every single movie they've seen in theaters. Personally, I keep my movie tickets in a keepsake treasure chest, and have over 10 years worth of tickets. But now you can show of your love of films and your collection of tickets in a cool way. 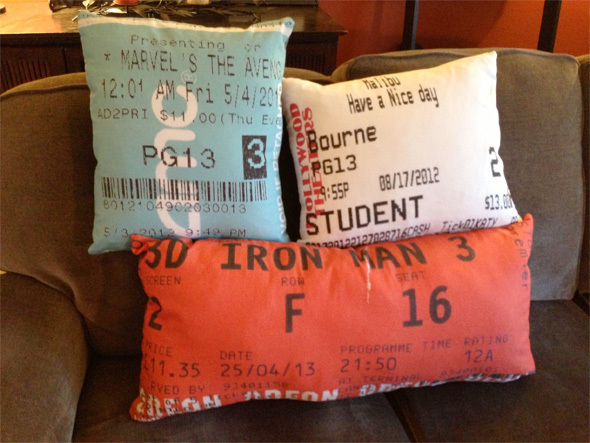 Reddit user Sunflower_Fortunado received an awesome gift from his mother for his new apartment in the form of three pillows with fabric created using the images of three movie tickets that he personally chose for the project. The poster discusses why he picked those three stubs, "I chose Iron Man because I went to go see it while I was abroad (and because I like how orange tickets from Odeon are), I picked the Avengers because I really really liked it (superheroes are kind of my favorite) and The Bourne Legacy because it was the first movie that my roommate and I saw together (which I thought would be nice, wish the movie was a bit better though)." This was made possible thanks to the people at Spoonflower.com, who will created fabrics from images you send them. Just find someone who can sew the fabric and you can have cool pillows of your own. We're sure there's plenty of other smart ways to use that service too. Cool? That's cool, Sadly, Some movie theaters now are no longer using ticket stubs, Instead, its just receipt paper. Indeed my local Odeon only sometimes print Orange tickets. It depends where you purchase the ticket from. If you go to the ticket both you get a proper ticket but everywhere else (the self-service machine and drink/popcorn stand) give you a receipt and the ticket both is closed most of the time. The Muvico I go to is only giving the paper tickets, and i have to buy it inside since they don't have anyone in the ticket booth. I guess it makes sense from a business standpoint, why have an entire separate printing system and booth dedicated to tickets when you can just use the receipts. If it helps keep costs down it's fair enough. I like proper tickets but I wouldn't pay more for them. My local movie theater only gives you a standard receipt without the name of the movie or other details. I would love to use this for concert tix. As long as they didn't pay to see it, why would they be pissed? i would be happy to have it! not ashamed to say i LOVED that terrible movie! This is better than the guy that tattooed a McDonald's receipt on his arm.